Cool style, made for warm memories. 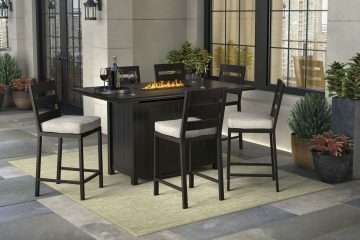 That’s the beauty of the Perrymount outdoor bar stool. 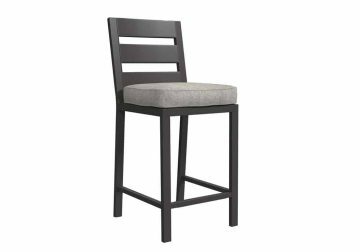 Finished in a rich, dark brown with distressed look accents, the rust-proof aluminum bar stool with crisp and clean slat-back styling is made to last. The sumptuously thick seat cushion is removable and wrapped in high-performing Nuvella™ fabric for easy-breezy care. *Fire pit table and four barstools not included. Cushioned aluminum high dining fire table set. Rust free aluminum. High performance Nuvella fabric. Make 5 or 7 piece sets with either 4 or 6 bar stools. Bar height table has concealed storage area with shelves. Table includes CSA approved 40,000 BTU stainless steel burner, glass beads and burner cover. Battery operated igniter (battery included). Can be converted for natural gas use. Assembly required.